Pushing for Peace Seminar, Burwell, Cambridgeshire, July 2014. Organised by Quentin Cooke of Burwell Aikido Club and brilliantly done so too. It is almost pointless trying to explain what went on, because unless you were there you won’t believe it and you certainly won’t feel it either. At every hour there was a choice of three internationally acclaimed teachers, so a choice had to be made to attend which ever seemed to offer the greatest personal value. Not easy. In no particular order I’d like to share what I thought I gained, yet I know only too well that in the absence of the guiding consciousness of the teacher, what I have to share is only a poor copy of their own mastery. Paul Linden was superb, in all he did and said. He is a man of slight build and suffers from Parkinson’s, his attitude and ability are awesome, his sense of humour and his humility second to none. “Are you ready?” he asked his young uke as he prepared to launch an attack. “Yes”, she replied. “Wrong answer”, said Paul. The truth of the matter? When you ready yourself you tense, when you are 'not ready' you relax. (I suspect you can prepare for the attack yet not tense.) Then the word 'attack', perhaps it is better if you do not see it as such but see it as a gift. The change in your own body and the reaction of the 'attacker' is quite remarkable when you implement the 'gift' idea. We tried an exercise where uke grabs hard at your arm, first seeing it as an attack then secondly as a gift; the attack is met with resistance and conflict the gift is received with thanks and softness which in turn surprises uke as there seems to be nothing there in response to his attack . . . it takes their mind. Paul demonstrated no techniques but lots of Aikido, he sought his own peace by finding the easiest path to remove the threat ... in his own words “I try to save Uke, only when I cannot save him do I resort to saving myself.” He was, rather, is, brilliant, you cannot fail to learn from him, he has changed so much of my understanding with only one lesson. Who was next? Hard to see . . . ah yes Steve Fyffe the blind teacher. But he wasn't a blind teacher he was merely blind in sight not in mind. There would be many a sighted person who would envy his Aikido and his poise and balance. We took it in turns to wear blindfolds and train with a sighted partner . . . . when it came to the punches we were hit before reacting. A very interesting learning curve that Steve had mastered but few would choose to copy. Luke Archer, an Irishman from France, taught us about verbal Aikido. How rarely we might be physically attacked and yet how frequently verbally attacked in life . . . yet we only train hard for the physical. With a few tips from Luke, neutralising insults, bullying and rudeness became an interesting, successful and relaxing 'game'. 'That's rubbish', I hear you say . . . Well, I'm interested in your comment, what exactly do you mean by 'rubbish', what other things do you consider 'rubbish' . . . let's have a coffee together and you can tell me more . . . I have to say that I wasn't too good at it but now have a copy of his book to help me on my way. Gunter Buck taught us about animal competencies and links to Aikido by using animal Chi Kung. Gunter could not only show the efficacy of the chi kung for health as well as martial content but could explain how the concept could be used in psychological therapy. Gunter's expression of Ki, (Chi), was very powerful. Sadly not many attended his classes which is often the case with aikido students as they commonly think training their art is all about techniques on the mat. . . it is patently not so and anyone attending Gunter's class would have come away much the wiser. Judith Elze gave a workshop on connecting. Once again we are obliged to leave our comfort zone and explore for ourselves how to connect. 'Connect with what?' . . . firstly to connect consciously with self and all parts of your body at will, then to connect to the earth and only to move when you have created a conscious connection with the muscles required (my interpretation) then to create connection with surroundings and other people within those surroundings. All these things will put you in the real world and not the world imagined by your mind. 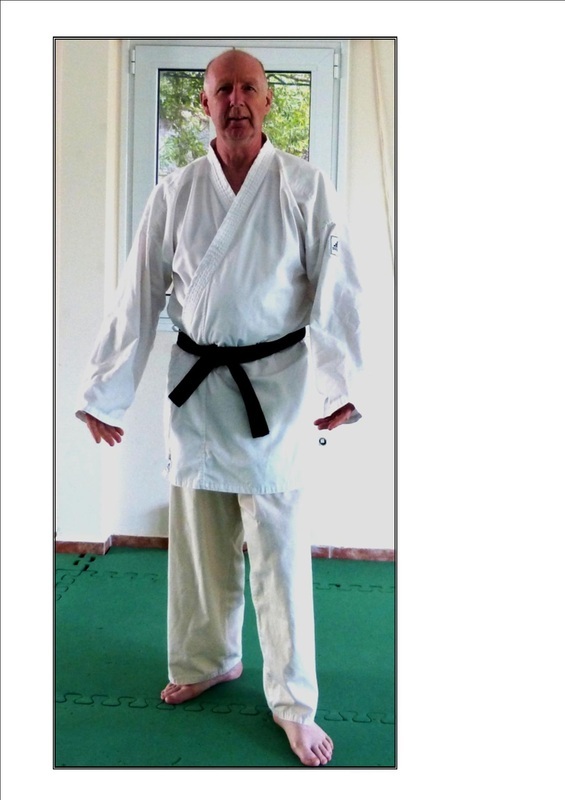 Jack Richford introduced the idea of games to encourage attendance of and development of aikido. Jack was full, and I mean full, of enthusiasm for taking the art to as many people as he could, with the ethos of building for peace. Despite our varying ages and the natural reluctance to make fools of ourselves, it was not long before we all joined in happily with the various games that readily added significant value to our pursuit of effective Aikido. There were many others teaching, they taught and they learned, they gave and the shared. I was lucky to practice with many of them, I am grateful. It was a very informative and happy seminar with lessons of a lifetime to last a lifetime. Why didn't you come too? I have to say that it’s somewhat of an embarrassing title to me, and that in itself unveils one of my own long struggles in life. However, I tell myself that this story is born not of reality but of dreams and that makes it easier to write. The enemy within is real enough, the internal enemies of ego and greed, of doubt, embarrassment, fear of rejection and humiliation. These are enemies that transcend race, creed, age, gender or ability, we are all equally at their mercy; a mercy seldom if ever given and never offered. It’s been a long journey during which time of travelling I have often been tested and so often defeated sometimes without realisation so subtle is the enemy. The one I’ve followed for 40 years now, had some ideas on this . . .
one's own body and soul. I woke early that Spring morning and gathered my belongings for the journey to yet another battlefield, for we always think it is some place else; yet unknowing, we carry it with us every where we go. Spare clothes, uniform and weapons were duly packed in my vehicle and the day felt good. The day was good and I felt good, even if a little aged and with the odd pain in my hands – I considered at some depth what it might be and how long it might last. However, in general, it was a good day on which to set off to fight my ‘war’, a war I live in hopes of winning one day. By win, I mean, to find peace within. There is no anger or sense of revenge, no hatred or angst – for they too are our enemy within. It will often be they that choose the field upon which you will metaphorically do or die. Unusually the Sun is shining, if you live on the UK west coast you will know what I mean! The first part of the journey is without incident – all is peaceful – the world at large may be gripped in conflict but inside my car it was at peace. It's the only peace we can ever experience – our own. The transport cafe was full of good natured drivers having their rest breaks. I ordered the large breakfast minus the beans and toast. Despite being an advocate of the Paleolithic diet, I accepted the fried potatoes. There was no conflict between me and the potatoes. Though they were not on my 'list', in my heart they were not the enemy – not today. The motorways too were more peaceful this day; we all drove in harmony, all going the same way. (It helps, doesn't it). The odd poor soul did cut across my path to take an exit for which they had prepared badly . . . or perhaps cleverly ! I have to confess a curse did pass my lips, a pointless gesture as you will know and it served only to damage me not them. My stress level was elevated, my immune system lowered and a few minutes of my life that could have been contented were otherwise made distraught. The enemy within is a skilled and often smiling assassin, striking when the innocent is least ready. The radio was tuned in to a pleasing programme, a gentle speaking man talked of quiet heroism in war; his chosen music was Amazing Grace with the band of the Scots Guards and Waltzing Matilda sung by a powerful and emotive Australian woman. Both were poignant and stirring music, as befits 'warriors' setting out to do battle. I was travelling to meet with like minded colleagues, fellow warriors of the way. They would be gathering in a harmony and friendship that can only be born of facing a common struggle. Each must fight their own battle but each would be bounded by others seeking the same success – comrades all. United in a moment of peace, the uniformed warriors of the way with bright white gi and pressed black hakama, weapons ready but dormant by their sides, bow reverently to the founder’s image and prevailing spirit. This is a brief encounter with real peace, humility and intention, this moment when they all bow together. Our leader stands before us, exalting us to do our best and to do only good in our efforts to defeat the enemy (within). This was not a beginning, nor was it an end for it would often appear that our journey has neither. The experienced warrior shares hard won knowledge to keep others safe, because at some time and for some reason they felt they too needed to know. Perhaps others do not need to know; perhaps they don't want to know. And so our warrior finds yet another battle, the one that requires coming to terms with it being their journey and theirs alone. In any event, regardless of our ambitions, our glorious victories or shameful defeats we must make the most of our days on the path. March 2014 on my way to Reading Zenshin Aikido, Berks. It is said that the faintest pencil is more powerful than the greatest mind. I hope you might find this a humorous tale about Gi’s …. Unless of course you have one the same ! (Gi; a term I am using to describe the heavy duty white pyjama like clothing as used in Judo, Karate and Aikido). So often they seem ill fitting, and on occasions you might just wonder what sort of animal they were made for ….. Certainly not human at times I suspect.. perhaps made to fit O’Uke, the Yeti like brute you always fear will one day attend the seminar for which you have just booked while sporting a recovering injury. It reminds me of many years ago when I had a peasant like job for the Government’s civil engineering laboratories. Apart from a pair of rubber boots, a pencil, ruler, chair, desk and name on the shared office door, they issued me with a pair of overalls; a sort of boiler suit affair. They looked good until I tried them on and found they did not fit …. anywhere ! Walking in them was difficult as the crotch of the garment was closer to my knees than my groin. ‘No problem’, I thought, ‘just take them back to stores’. The simple apology and exchange I expected did not come to pass, the store-man simply looked up over his glasses and said, “I’m sorry too, but if a Ministry boiler suit fits you then you’re deformed”. A few months later in the UK, an Aikidoka takes possession of his new Gi, confident in its quality as it was recommended by his teacher who said he made no profit from the sale and that he knew lots of people who wore theirs with pride and satisfaction … mainly at other clubs apparently. He tried to pull them up to his waist, but something was stopping them being pulled right up, … yes … it was his groin! Looking down at the crisp starch white Gi trousers he observes the knee pad patches and decides to try them out. Our Aikidoka kneels in seiza, the back of the trousers slip lower still and expose what is commonly termed ‘builder’s bum’, and there in full view, resting not under his knees but on his upper legs are a pair of crisp starch white reinforced knee pads. He consoles self yet again, “They’re not too bad for thirty quid, and they do have some lovely embroidered oriental writing on the label.” ….. Little does he realise that these are merely essential laundry instructions that he can never knowingly follow and not the warrior like spiritual aphorisms of aspiration as he thinks they are. Then there was the classic half hippo half kangaroo animal he saw as a beautifully embroidered dragon. “Crumbs,” he thought, “they could do with an interpreter never mind a tailor”. The Gi jacket slipped on easily, the arms were a good length … conveniently about the same length as his own … the body of the jacket is comfortingly long and overlaps his low slung waist band easily. He suddenly feels good and acts out an imaginary technique in front of the all admiring mirror. He contemplates how swish he will look on the tatami in his new Gi … ‘ah, the envy of all who watch’ …. he thought. “Enough of this, young man”, he says to himself, “Let’s try the belt on….. See if we remember how to tie it eh?” He crossed the jacket left over right - “er, or was that right over left”, he thought. He busied himself watching his hands wrap the belt around his body twice and then make several attempts to have a flat knot that pointed in the right direction. At last it was done, mind you there seemed to be almost enough spare belt left over for another trip around his midriff. Still, perhaps he would grow into it, you know, develop a good centre as they say. Dressing now complete he eagerly anticipated admiring his latest martial attire in the mirror, oh, how good he felt, how magnificent he would be at class, he could hardly wait. Then horror of all horrors, the image that looked back at him from the mirror was not remotely how he had seen it in his mind. The Jacket was fine at the bottom but at the top it didn't meet at all, leaving half an acre of hairy chest exposed. Even tugging it from both sides did not help ... it was just simply short of material. Even at his level he could envisage a new and unexpected life experience on the mat, as his scrunched waist band cut mercilessly into his hips and with his Sensei’s voice ringing in his ears, “get those trousers shortened before you lose a toe in them”, some gorilla like uke would be tearing out handfuls of chest hair instead of gripping his lapels. .................... Oh well, not to worry, at least it was a lot better than his last Gi. Not just Gi's apparently ! Can't come tonight I have some new shoes. If it was in winter, I'd come. If it was in summer, I'd come. I can't lift my arms up like this so I can't do that. My husband says it's rubbish, he used to do Judo you know. I've just had my dinner. Must pack as I'm on holiday next week. I haven't washed my feet. My gi is still in the wash from last week. I did a nasty technique on that big bloke last week and I'm waiting for him to forget or take up another art. It was a week long live in training session at the Dojo, I was there training when I could (or felt like it!) and happened to ask why we hadn't trained in yonkyu for some time. As you mostly know an often excruciatingly painful pressure point technique on the thumb side inner wrist .... a bit like elbowing something hard with your funny bone, that sort of feeling. Well the teacher agreed that it was worth revisiting and planned it for the first class in the afternoon. Over lunch I had a chance to look around the garden and saw lots of jobs that really needed doing ... urgently I thought at the time ... so I made my excuses for missing the class. They still did yonku ... for about an hour and a half .... as you know it is bad etiquette to scream out loud in the dojo ... unless it is a kiai of course. As I worked away on pruning and edging lawns around the dojo I could hear their silent screams passing through the walls and into outer space. They all seemed to enjoy it and all thanked me profusely at tea break. Extracts of an imagined conversation at an aikido seminar. “Ok. if you really want to know; she eats a proper balanced diet that suits her body type. . . and sticks to it too … no cheating ever. Keeps clean, likes swimming, and washes frequently. She rests at the right times. . . she realises when the body needs to regenerate and sleeps. . . no forcing herself to stay up and watch TV or check the computer for messages. In training she is energy sensitive, loyal, trustworthy, totally attentive, moves well, using the whole body in a relaxed but powerful and totally coordinated way and uses the eyes in a focussed manner. . . much like the eyes of a predator, taking everything in, missing nothing. Despite being self driven and determined she listens and follows instructions willingly, not once has she questioned my teaching, not once has she criticised me behind my back. She is an excellent student. I think she is in it for life and not for the occasional socialising like so many students can be these days. We haven’t had to spend a lot of money on bedding etc as she seems happy to sleep on the floor. . . it must be good for her back or something. We have of course supplied blankets and crockery and she has the run of half the house. I strongly suspect she is highly intelligent but has never spoken to us yet about her ideas. . . . She is just totally natural with a good personality and gets on with everyone she meets”. “You are right and no he didn't. . . but I think secretly he was so impressed by the description I gave him that he's now looking forward to taking her out ! Strange thing is, she won't judge him and will probably go”. Their minds wandered briefly to the day dream world; they smiled and they laughed. Happy days, Elsa uchideshi days. To save my luggage weight on a trip abroad I was assured that I could borrow a Gi. It had been worn by another student I know too, we are much the same in height so I knew there would be no problem with fit. I weigh just under 100 Kg. I’ve enclosed a photo taken with no attempt to make the Gi fit worse than it does, in fact I went to some effort to keep it a snug fit. Who did they make it for? Bigfoot? The Yeti? Even folding the sleeves was only temporary as they soon rolled themselves down to their natural state. . . interesting training in a Gi that would almost make a good marquee.